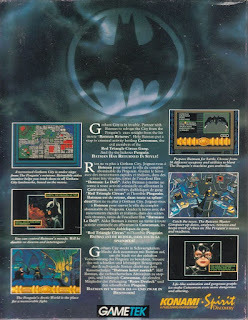 Front and back of Batman Returns DOS game packaging. Images from Moby Games. Released by Konami in December of 1992, I'm sure this game completely slid under my radar because I only had an Intel 386 computer (actually... I can't even remember if my family had a home PC in 1992). I also have vague memories of the SNES Batman Returns and the SEGA Batman Returns console games being near identical, so I may have just dismissed the DOS version as just another port of the beat-em up version that was available on the home console systems. Totally not the case. I was able to dig up this game thanks to the magic of DOSBox and the power of google searching. 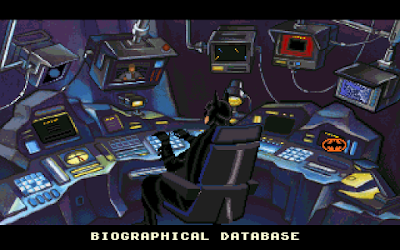 While I couldn't find the actual manual that came with the game, I did find a nifty Batman Returns DOS FAQ written by odino. Whoever/wherever you are odino, props to you. There's an old adage about 'not judging a book by it's cover', which I'm sure is a great lesson to apply when you're at a library, but I'm a consumer and packaging is very important to me. 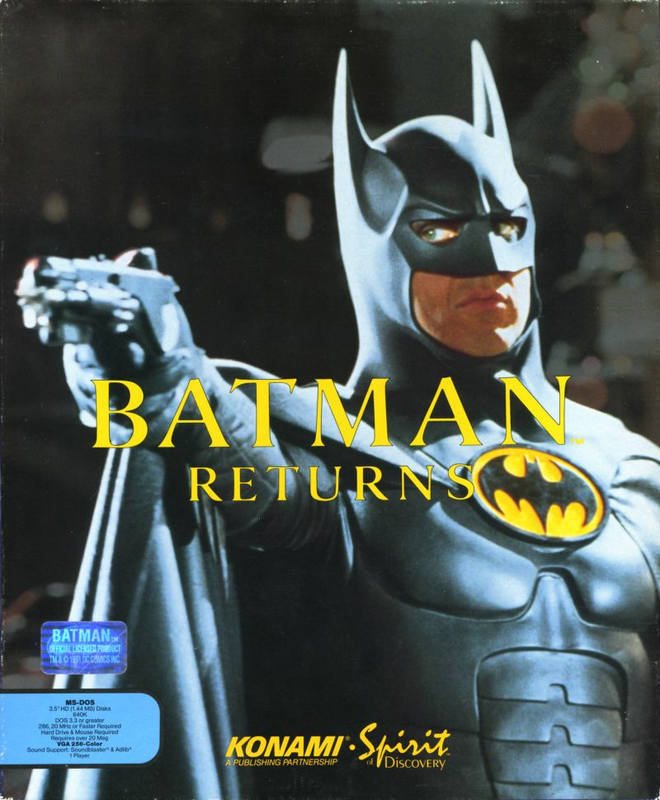 The front of the box doesn't tell me very much [the front of the box could've just as easily been a movie still from 1989's Batman, but it's not. How can you tell? 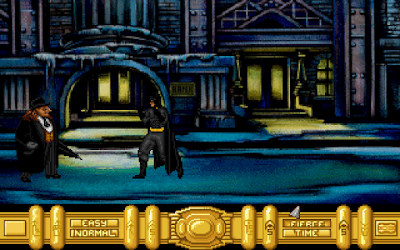 Look at Batman's abs; it's his Batman Returns costume. 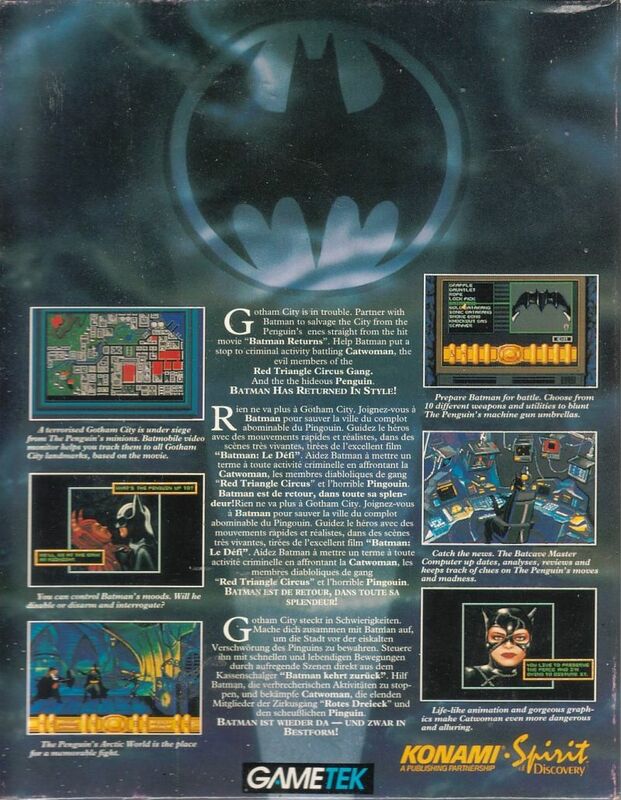 ], but the back of the box boasts a SIM CITY view of Gotham, at least one platforming stage, and a lot of digitized cut scenes. At first I was a little vexed that the French text on the back of the box was about twice the length of the English and German text, but quickly realized that it was just a cut & paste error and they pasted the French text twice. Enough about first impressions... let's get this game executed. So, apparently, this game was created by Park Place Productions. 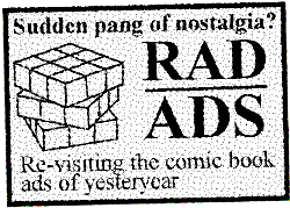 Wikipedia tells me that "Park Place Productions went on to become the largest independent developer of computer games in 1993 with 130 developers making 45 games for 14 video game publishing companies" and "At the end of December 1993 the company collapsed". Interesting. Sadly, the co-founder of Park Place Productions, Michael Knox, died of colon cancer in 2009. There's a bit of gaming history for you there, folks. 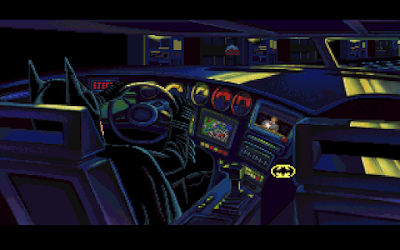 The first playable screen involves you in the Batcave getting to decide what to do. A quick intro screen prior to this shows us the Bat Signal being activated over the city of Gotham. I'm using my PC speakers for sound and there's this terrible droning and it sounds so bad I had to shut the sound off. [Like, it sounds like a swarm of bees. 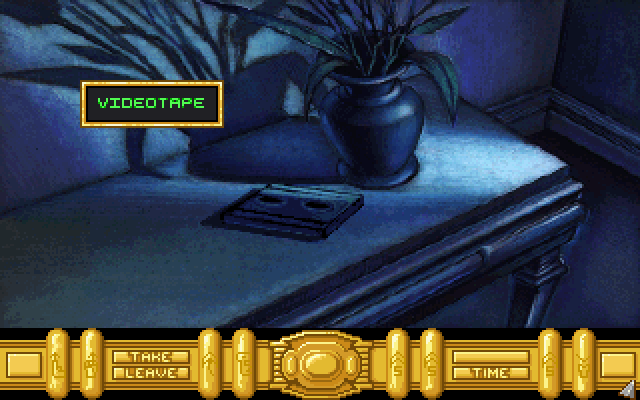 I hope this game isn't heavily dependent on audio.] The opening screen let's you mouse-over items in the Batcave and it immediately feels like one of those Space Quest/Police Quest/Leisure Suit Larry point-and-click adventures games I loved so much in the early 90s. I think this game and I are going to get along real well. Sitting at Batman's computer desk gives you yet more options of cool things you can do. A quick mouse-over of my various options ['evidence', 'biographical database', 'news broadcast', 'video'] indicates to me that I'm probably going to spend more time playing detective than, say, beating the Penguin over the head with his own umbrella. Which is good. I'm still digging this. Watching the NEWS BROADCAST has a digitized spokesperson telling me Gotham's economy is down, the youth of Gotham are getting dumber and some circus hoodlums are attacking the Gotham Plaza downtown. There's a nice BIOGRAPHICAL DATABASE full of 'known criminals' who I'm sure we're probably part of the production staff for this game. Just by chance I moused-over the VAULT and managed to find some sort of computer that let me select my utility belt weapons. I would've felt pretty stupid leaving the Batcave without my utility belt. Picking items for your utility belt is an interesting dilemma: I have 10 items to choose and only 8 slots on my utility belt to contain them in. To makes matters even more interesting, I have no clue what any of the items do - no descriptions are provided. 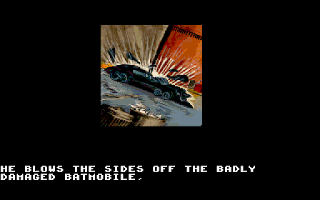 [I guess this is what the game manual was for.] I'm just going to try to pick things I might need... a ROPE? Sure, why not. Not sure what a GAUNTLET is, but it looks menacing, so I'll grab it. SCANNERs always seem to come in handy when detecting things. 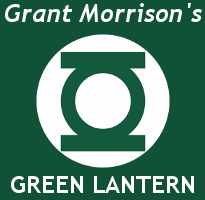 Grab a few BATARANGS and off I go. Hitting up the GARAGE gets you in the Batmobile. Again, another screen that requires you to mous-over things. 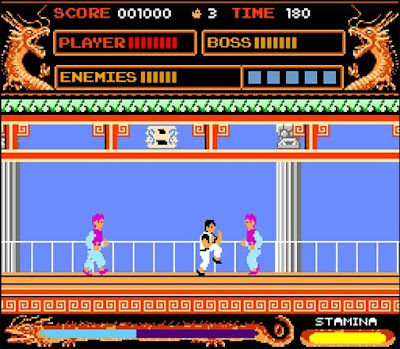 So far, no real reflexes or button-mashing required. Very happy with this so far. 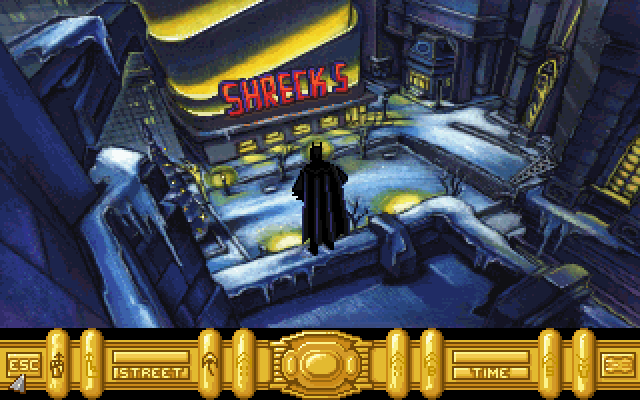 I was poking at a few buttons in the Batmobile (particularly the NAVIGATION SYSTEM), and suddenly I'm at Shreck's. I don't know how I got here. I'm still not sure where I'm going or why I'm doing what. This game really requires you to have some direction and purpose in life (as Batman) in order to accomplish anything. Something came up and I had to step away from the game. When I returned, it told me we were onto "Day 2". Time seems to be a factor here. I'm going to restart the game now as I pretty much wasted Day 1 trying to understand the controls. So the game appears to be more than Batman just showing up places and beating up clowns. Events happen in the game that seem to be in sync with the internal TIME of the game. 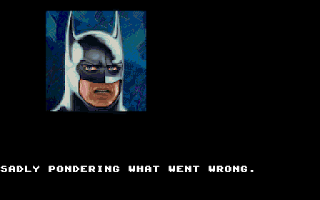 So really, you need to be at the right place at the right time to progress (and you need to have the 'right' utility belt item with you at the time). It took me a couple tries to figure this out. You also need to interrogate the right hoodlums [and ask the *right* questions], instead of beating the crap out of them, to get clues giving you leads on what to do next. 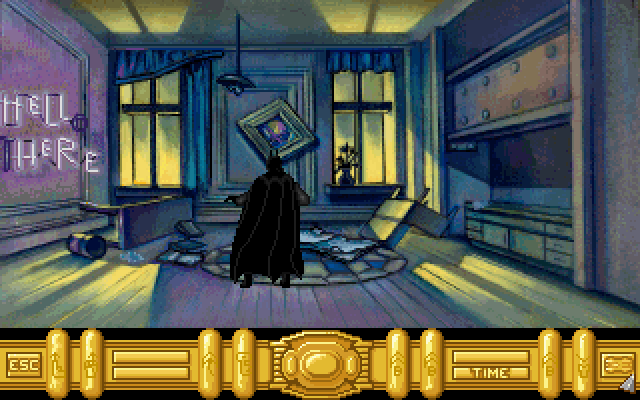 Sometimes random 'evidence' items are left lying around, and Batman needs to collect them in order to run to the Batcave and analyze them. As you've probably guessed, these items also appear on a schedule and not checking the right locale at the right time means you'll miss them. I appreciate the ingenuity of this game, but I feel like I'm frantically trying to cover ever locale as often as I can for fear of missing something. 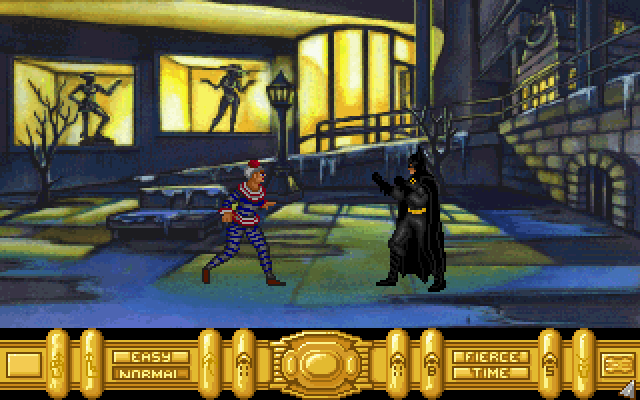 After following a bunch of leads and visiting new locales on the Gotham City map, by Day 2 I was suddenly squaring off against the Penguin himself. [Ha, didn't see this one coming so quickly.] It didn't end so well for Batman - I still need to figure out how to fight. Apparently there is no real fighting system? For some reason pushing my 'U' and 'J' keyboard buttons seem to allow me to attack. Can't figure out how to dodge attacks, though. By Day 3 [in the game's time] I was hopelessly stuck. I just kept visiting the same locales and fighting the same clowns. 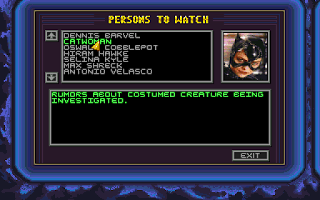 So far, I've seen a few references to Christopher Walkens' character (Max Shreck) but nothing about Catwoman. Up to this point, this has been a very Penguin-centric game. There are references to events in the movie (ex: Penguin saves Mayor's son) but we don't get to see it or interact with it. I'm really not liking this platform fighting system. It's wild and chaotic at best. This game is a whole lot of 'trial-and-error'. I must've restarted from the beginning about seven times now. "Just check the FAQ", you say. Well, the big appeal of point-and-click adventure games is solving the mystery/adventure on your own. Do yourself a favor and actually try to solve it without referring to the FAQ. It's a 'the journey is more enriching than reaching the destination' type of deal. Once you know the solution and exact sequence of events, you can probably complete the game in an hour or two. 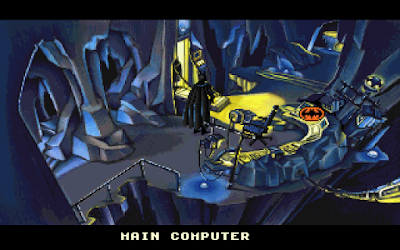 Thankfully, Batman Returns DOS has a save/load game feature so I don't have to keep re-doing Days 1 to 3 over and over again (collecting evidence and etc). 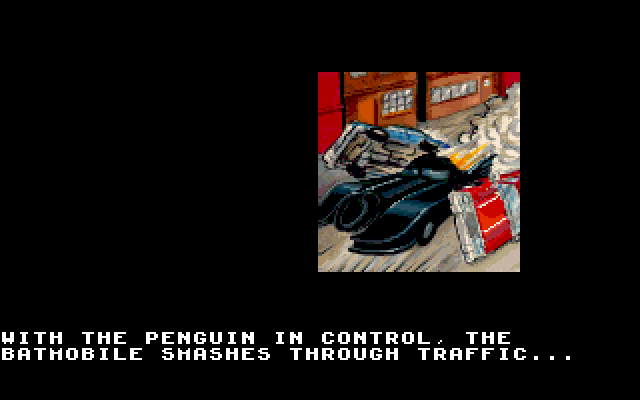 A bit or poking and prodding has revealed that you have 7 Days to stop the Penguin otherwise it's game over. 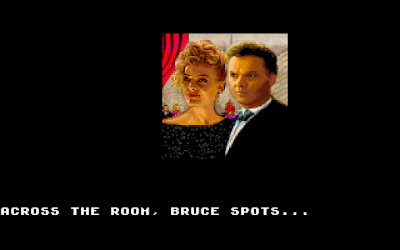 Alright, just took a glimpse at a different Batman Returns DOS walkthrough and realized that I wasn't using the correct tool for the right job, hence completely eliminating the option of encountering Catwoman in the game. [For anyone wondering, if you're not SCANNING the evidence in Shreck's office and just TAKING them, new evidence won't appear in his office anymore. Pretty clever, really.] I will admit, this is a little annoying. 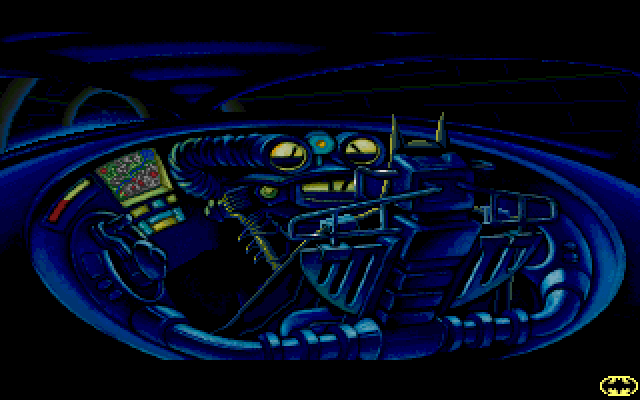 Most *other* adventure games (ex: Hugo's House of Horrors) had some sort of 'point system' at the top of the screen indicating if you were on the right track to completing the game (or not). Even an in-game hint or tip would've helped here. I've been playing off and on for about three [real-time] days now. By Day 5, Penguin throws down the gauntlet and straight up challenges you to stop him. 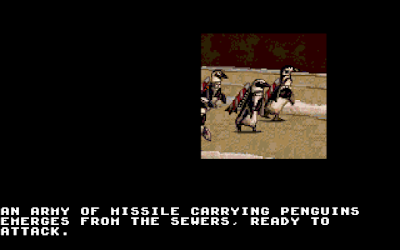 You end up fighting the Penguin A LOT, and since the fighting controls are just junk, you always feel that you were cheated out of your victory [typically the Penguin takes a bunch of damage and then flees before you can finish the fight]. 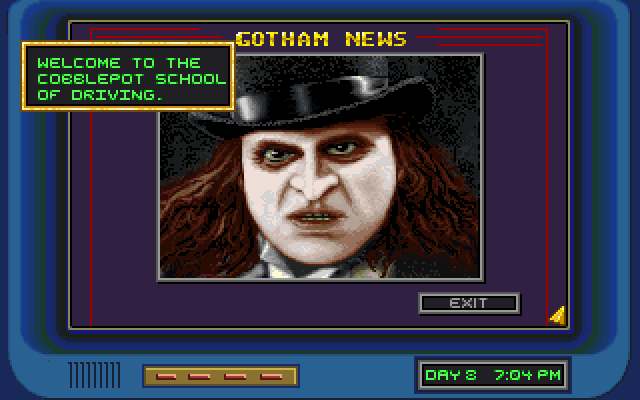 I started to get the 'gist' of the game and realize that it's mainly about collecting evidence and interrogating thugs for info about the Penguin's plans or locations. 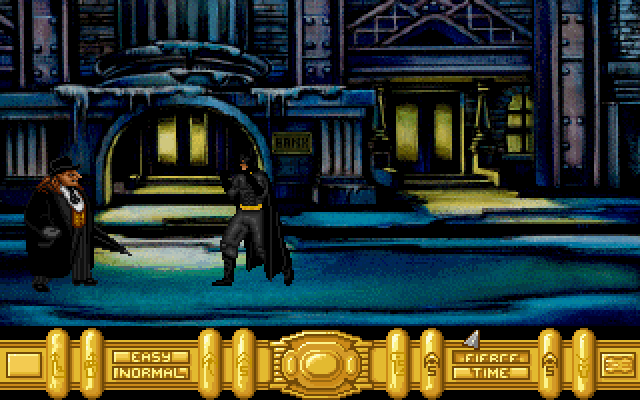 I'm starting to think that the fights aren't that important and you can pretty much get through the game without throwing a single punch (except for the Penguin battles - the Batarangs don't seem to work on him). I can't even stress how important being at the right place at the right hour [to pick up the right evidence] is. Actually, it's probably the most frustrating aspect of this game. If you didn't pick up specific evidence at certain in-game hours of the game, new locations will never revealed to you and you'll never be able to complete the game. Thankfully, there's a way to advance the in-game time, but unless you know when and where to be, it doesn't really help much. 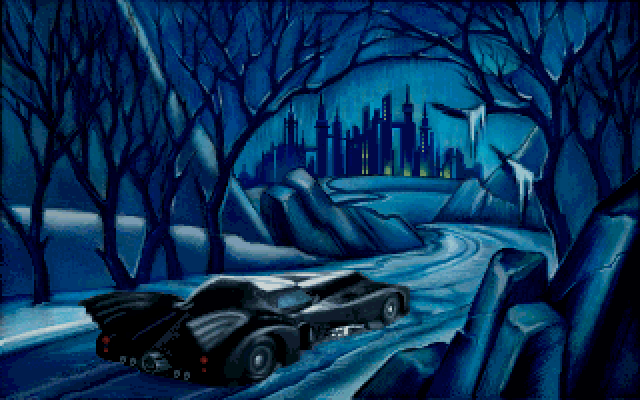 As the game progresses, there's a few major plot elements of the Batman Returns film that occur, but you don't have any control of them and you just spend your time watching digitized cut scenes. 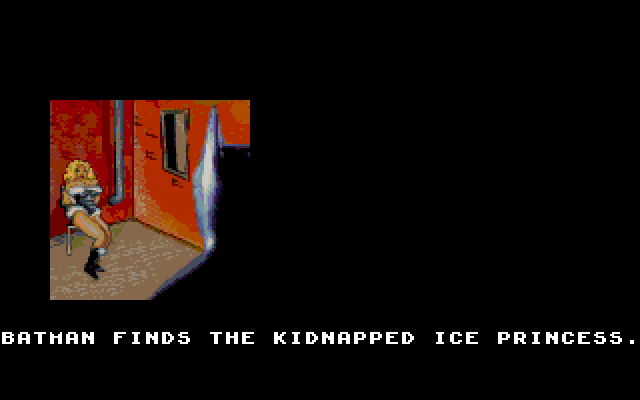 Apparently, there is a way to save the Ice Princess from falling to her death, but involves you collecting the right sequence of evidence before the event happens. 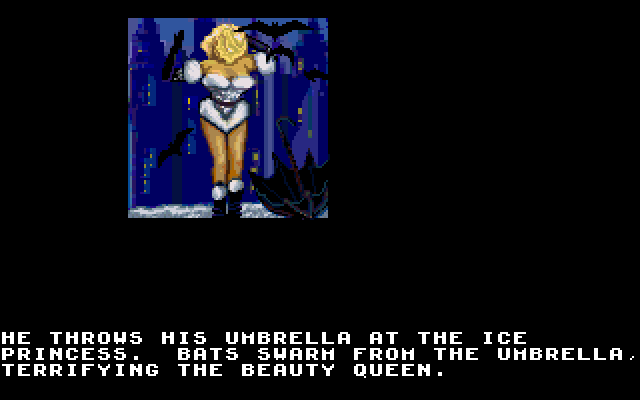 However, I seem to remember the death of the Ice Princess being an integral plot device for the Batman Returns film? ...and driving the Batskiboat (well, not really driving... but more like getting to sit in the cockpit). 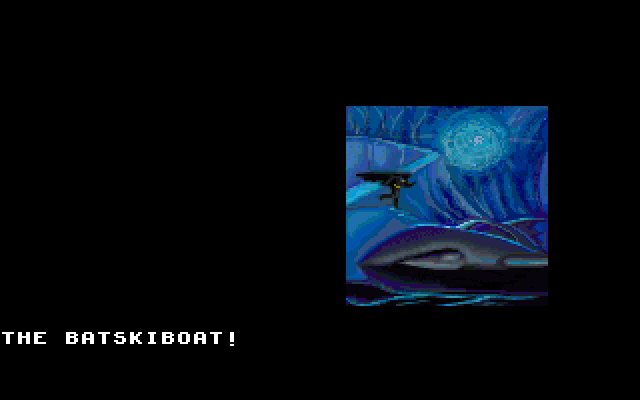 The Batskiboat appears at the end of the film, so you know you're getting somewhere when you have access to it. I've concluded that you really don't need to actually do any button mashing for fighting - it's all done automatically depending on whether you chose the EASY, NORMAL or FIERCE mode on your Utility Belt. Well, that solves that. Okay. Yes, the game is dated. The graphics are on par with VGA or even Super VGA. 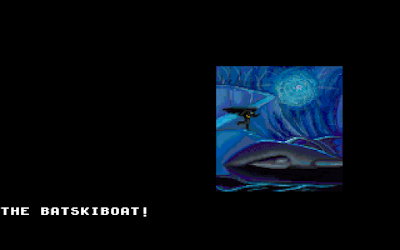 The visuals are pretty pixilated and is reminiscent of those Space Quest/Police Quest I mentioned earlier. That doesn't bother me. This game is still interesting and engaging, and I'm able to recognize the important things on screen. 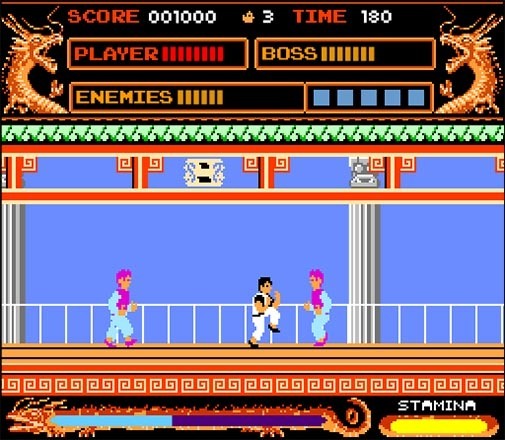 The controls are choppy and slightly unresponsive and confusing (especially when you are mashing buttons during the fight sequences), but the fight sequences are short and the rest is mainly point-and-click. And, we've just determined that the fight sequences are automated - so forget my complaints about in-game fighting. Someone's probably going to point out that this game isn't very user-friendly, but I'm going to quickly point out that back in the early 90s software developers felt that the best way to discourage software piracy was to make a computer game pretty damned difficult without the original game manual (which you only received when you bought a legal copy). Back in 1992, home printers weren't anything like we have now, so printing out a full color manual wasn't really an option. Yes, it is a glitchy point-and-click game, but it's a lot better than the previous alternative: the text parser adventure game. You want to know frustration? 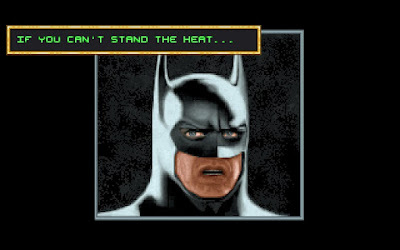 Try figuring out why Batman won't pick up the poster after you've tried every variation of typing in "TAKE POSTER" only to discover the text parser only accepts "TAKE EVIDENCE" as a command or something ridiculous like that. I like the little details in this game. Such as: if you don't equip your ROPE or GRAPPLE GUN to your Utility Belt before you leave the Batcave, when you reach a new locale, you will start on the street rather than the roof (and will have no access to the roof). I'm pretty sure it's possible to complete the game without solving the mystery of Selina Kyle/Catwoman. It reminds me of those CHOOSE YOUR ADVENTURE books I was so fond of in elementary school. If you are at all familiar with the plot of 1992's Batman Returns, that will help greatly with gaining the general gist of what you should be doing in this game. If I'd never watched the film, I still think I'd be able to play this since it follows a logical flow. 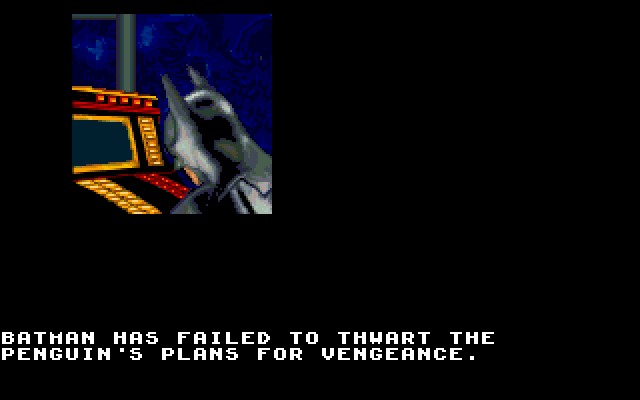 This game really doesn't deviate from the central plot of Batman Returns, and doesn't really add anything new to the story. You don't get to battle Catwoman whatsoever throughout the game. She makes a few appearances in a few cut scenes, but that's about it. 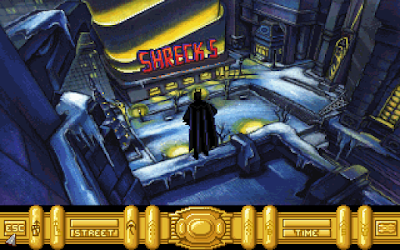 The game ignores some very important scenes in the movie: there's no cut scene or reference of Selina being thrown out of a window by Schreck (i.e. 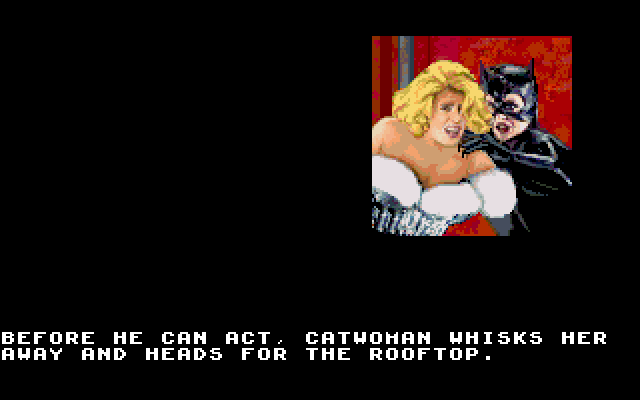 Catwoman begins), there's really nothing about Catwoman in this whole game. She gets an entry to herself in the biographical computer, but it's never really expounded upon. 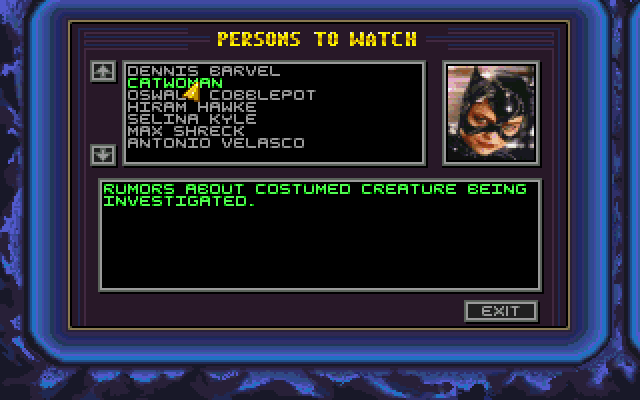 The developers kept the story tight to the game - so much so that they pretty much included on the barest details about Selina Kyle/Catwoman. It doesn't seem like they were able to add much in the way of story development. The game play is very basic and it's mainly relegated to pointing-and-clicking. It would've been neat to have an action sequence where you are fighting the penguin for control of the runaway Batmobile or assisting Alfred in diverting the Penguin Army, but that's all done automatically for you. One of my favorite action sequences in Batman Returns is when Batman battles the Red Triangle Circus thugs at the beginning of the film. There is no representation of this except for the one-on-one fights in the streets of the city where you may battle the strongman, the fat clown, the fire-breather or the acrobat. 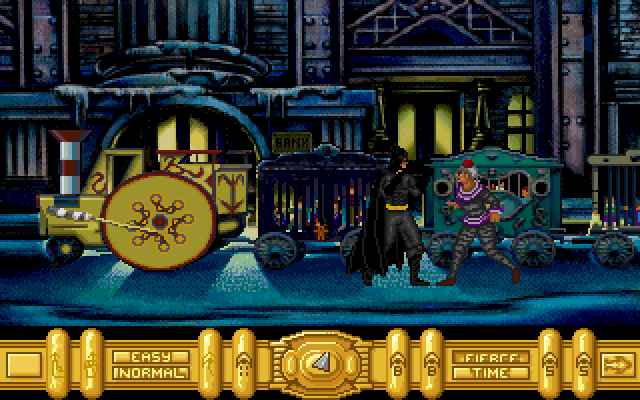 They did manage to include a playable scene in which Batman gets to rescue the kidnapped firstborns (you actually lose the game if you don't complete this in time.) There were no side missions or anything else that didn't have to actually do with the plot of the film. All in all, I felt like this game was a rush job, probably to coincide with the 1992 Christmas season. I felt like I was playing along!